^ "Columbia University Libraries Online Exhibitions | Type to Print: The Book & The Type Specimen Book". exhibitions.library.columbia.edu. Retrieved 2018-12-18. ^ a b c d e Kaufmann, Ueli (2015-10-11). "The design and spread of Froben's early Italics". Department of Typography & Graphic Communication. University of Reading. Retrieved 5 April 2017. ^ a b Morison, Stanley; Johnson, Alfred (2009). "3: The Chancery Types of Italy and France". In McKitterick, David John. Selected essays on the history of letter-forms in manuscript and print. Cambridge: Cambridge University Press. pp. 30–45. ISBN 978-0-521-18316-1. Retrieved 28 December 2015. 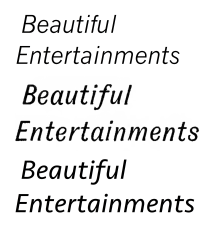 ^ Frutiger, Adrian (2014-05-08). Typefaces: The Complete Works (2nd ed.). Walter de Gruyter. p. 260. ISBN 978-3038212607. ^ Lo Celso, Alejandro. "Serial Type Families" (PDF). Archived from the original (PDF) on 2014-11-08.